I recently took a class on making an indigo fruit vat. The class was great, the vat is quick and easy and you can read how to do it here, but when it was over I was left wondering what’s going on in there? The interwebs are sort of helpful, in that you can read all about what happens in the indigo dye process, but there appears to be an underlying assumption that dyers aren’t interested in the chemistry behind what they’re doing, so there’s not a lot out there that puts it in layperson’s terms. And they tell you chemically what happens, but not why it happens. Personally, if I know how a process works, I find it a lot easier to do the steps involved correctly, because it makes sense why all the steps are there. If I’m trying to get a bunch of molecules to do what I want them to do, it will be more efficacious if I’m not bumbling around blindly. So I’ve spent a good amount of time looking for answers to this question, and what I ended up finding was that the ways and means of indigo extraction and dye methods mirror a lot of other human technologies— in the automotive world I call it the Technology of the Day. This molecule is not what is found in indigo-bearing plants (and snails!). True indigo (indigofera tinctoria) and woad, for instance, each contain different indigo precursors— molecules that will turn into indigo once they’ve been oxidized. This is the precursor to indigo found in the indigofera tinctoria plants. The bow-tie shape is a glucose molecule. When making an indigo vat from fresh plants, all that needs to be done is remove the glucose part of the indican, and you get the smaller indoxl molecule. This is what will penetrate the fiber, and then turn into indigo with the addition of oxygen. Putting the fresh plants in a vat and fermenting them will remove the glucose, because the yeasts from the fermentation will eat the sugar part of the molecule and leave the indoxl behind. 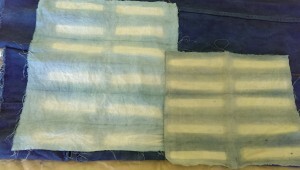 Here is a not only a nice article about different indigo precursors, but also a step-by-step tutorial on how to dye with fresh woad. The turning of soluble indigo-precursor plants into insoluble indigo is where we then go. The indigo can be moved around and traded rather than be tied to the place and season of the plant material. But it’s also one step forward, two steps back: that indigo molecule is not soluble in water. The indigo precursors in the plants are soluble, but in order to make indigo soluble, the oxygens on the indigo molecule need to form other bonds. 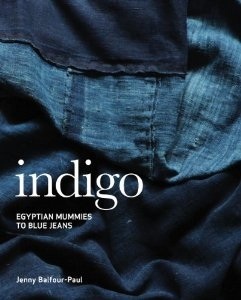 The indigo needs to be turned into indoxl, then it can be worked into the fibers to be dyed. When the fiber in this dye bath is taken out and reintroduced into the air, lo and behold it oxidizes— it takes up the oxygen molecules from the air and turns back into the insoluble indigo molecule, where it is held fast by electrostatic bonds within the fiber. The best technical description that I found of how the indigo molecule bonds with fiber can be found here. There are actually a lot of ways to go about making indigo soluble, and they all involve a reducing agent and an alkaline solution. This is the indigo vat. There are a lot of reducing agents, some of them very effective, and also toxic. 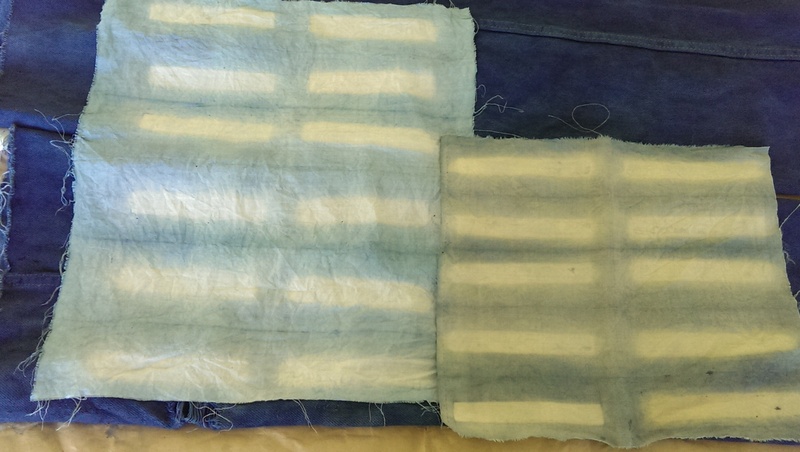 For instance, here’s the process for dyeing jeans. A reducing agent has free electrons that are readily available to bond with any oxygen in the vat, whether it be on the indigo molecule or oxygen from the air. I couldn’t really find any good descriptions as to why the vat needs to be alkaline— what work are those OH ions doing? I ended up calling my brother in-law, who has a degree in chemistry: a reducing agent adds it’s electrons to form other compounds, so the oxygen bonds on the indigo are transferred and form alcohol chains with the reducing agent. Alcohols are very water soluble. The OH’s in the alkaline solution strip hydrogens off this alcohol group and we end up with the indoxyl. The OH ions are highly reactive, and essentially make the solution even more soluble. The more OH ions, the stronger the alkaline solution is (and the more careful one needs to be in using and disposing of it). As there are a lot of reducing agents, so there are a lot of ways to go about this reduction, and you can see echoes of the original use of indigo-precursor plants: Fermenting urine is a tried and true method, because the ammonia in urine is already alkaline. Another traditional method is fermenting madder root and bran with soda ash or lye. Fermentations, aside from eating sugars in the original vats, also produce sulfur-containing organic compounds as by-products, which are effective reducing agents. As with any fermentation, you are relying on a process that involves time, often days, at a constant warm temperature. Not only do you have to wait to do your dyeing, but you must rely on a successful fermentation process. Commercial denim dyeing uses very efficient but also much harsher solutions, to the point where repeated dips in the vat need to be carefully timed so that the oxidized indigo already on the denim doesn’t get re-reduced and therefore removed again from the fiber. I’ve made soap, and I’m not a big fan of dealing with lye, so I’d prefer a weaker base. I’ve successfully made an indigo vat with the madder root and bran, and washing soda which has a weaker Ph than lye. It took about 10 days to be ready to use, and it’s, shall we say, a little stinky. This is the Technology of the Day part: how to get the result you want as cheaply and easily as possible. Cheap and easy are relative terms— for instance, what’s the cost to the environment, or the person using a highly alkaline solution? When you are done with the vat, how are you going to dispose of it? As a home dyer, you can make these choices for yourself. The fruit-vat method that I learned uses fructose from cooked-down fruit, which are reducing sugars, and pickling lime (calcium hydroxide) to make the solution alkaline. Fruit sugars are an expedient way to make a vat because they have free electrons available at the end of their chemical chains, and so are oxidized rapidly. Interestingly, sucrose, table sugar, will not work. Sucrose is a combination of glucose and fructose, but the way that chemical bond is formed takes up the free electrons at the ends of both chemical chains. Sucrose is not a reducing sugar. But water boiled down with fruits, dates, or honey and agave, all work well, and of course powdered fructose. Citrus doesn’t have a lot of fructose anyway, but the acids in citrus are also going to also going to make the vat less alkaline, so it’s not recommended. *So it should all be the same color if it’s all the same indigo molecule. Yes. Except if the indigo is precipitated from a plant source, it’s not going to be 100% indigo. There will be other molecules from the plant and the surrounding soil in there as well. Depending on what they are can change the appearance of the color. Also, depending on what fiber is being used the color will appear differently, because of the way that indigo bonds with the space within the fiber. If it’s lustrous like silk or matte like cotton it will appear differently. Depending on how alkaline the solution is, the protein fibers of silk or wool can be damaged. Depending on how well the fiber is worked in the vat will also effect how the color appears, based on how thoroughly the indoxyl is actually worked in or not. I’ve spent about a month since my indigo class trying to get answers to my question, and I finally feel pretty satisfied that I’ve learned what I wanted to know. This process has also shined a light on the fact that so many natural dye recipes are just that, recipes, without divulging the science and available technology behind them. My hope is to demystify the processes so I can dye with confidence and reasonable expectations. Cochineal, you’re next! Thank you so much for your informative post!! Just wondering if you have found any info about why overheating the indigo pigment will make it not work? Thanks! Thanks Emma, I’m glad you liked the post. I also wondered why there’s an upper temperature limit on this vat. From what I’ve found, the indigo itself doesn’t sublimate (break down) until much higher temps, and the calcium hydroxide should be likewise stable. My best guess is that the fructose loses it’s reducing properties when it gets too hot. Thanks for bringing this up, and I’ll update the post when I find a definite answer. This is so helpful. I find it does help to know how things work and your explanations are clear and very easy to understand. My experiments with the indigo vat have been many and varied but I will now have an enlightened dye day. I have seen a recipe for yeast and sugar. How does that work? I’m glad you found the post helpful! A yeast-and-sugar recipe would be a type of fermentation vat. Traditional fermentation vats are made with urine (which I have not tried) or madder root and wheat bran (which I have). Basically the yeasts doing the fermentation perform the oxygen reduction, rather than chemically in the fruit vat. The downside on the fermentation vats are needing to keep them at a constantly warm (but not too warm) temperature, and they can take a week or so until they are ready to use. Also: stinkier! I am so glad you were curious about the why and how of what’s going in the vat, and that you had a chemist in the family as well. I have this post bookmarked so I can keep refreshing myself after intervals between vats. I have had a go at both super fast sudden death chemical vat and slow bubbly madder & bran. Decided not to push the family with the urine……although some days I think they deserve it! Am a total convert to the fructose now though -so quick, and smells deliciously weird. I started with fruit, but found it actually worked out pretty expensive with a big vat, so switched to fructose powder. Still not that cheap, as it comes in small bags from a health food supplier – I look with envy at my home brewing partner who buys 40kg bags of dextrose (beer sugar as the kids call it) for next to nothing. Have searched the Google for a technical ref on whether dextrose would function as a reducing agent but no luck – wondering if your brother could shed some light? I’m so glad you like the post! Let me see what I can find out about dextrose. There are also a couple of other versions of the fruit vat, using iron or henna as a reducing agent. They both work just as well, and I like the henna one especially— the color is just a bit different. I’ll dig out the recipe ratios and get back to you. And here are links to the Maiwa blog posts about the henna vat and the ferrous (iron) vat. When I’ve used henna it’s just been in powdered form, the same ratio as the fruit vat. It also takes a bit longer to be ready. And the ferrous vat really is very fast at producing deep color. If you end up trying the dextrose, I’d love to hear your results! I will be off to the home brew shop for a big bag!